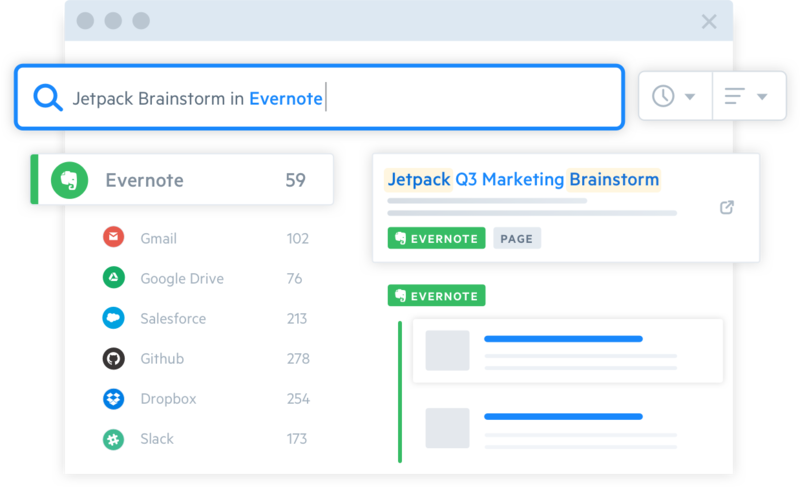 The Swiftype Enterprise Search Connector for Evernote is the quickest, easiest way to set up full-text search for your Evernote notebooks. 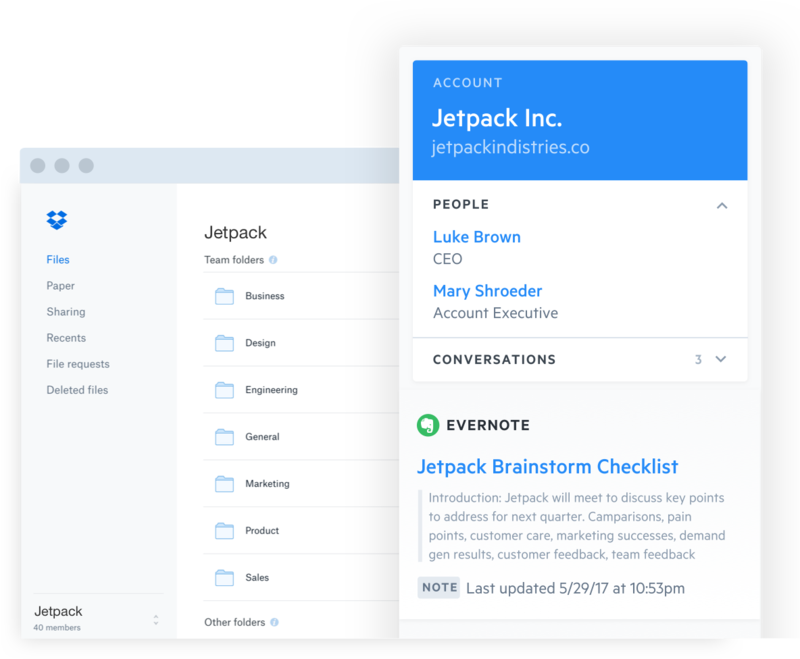 The connector indexes all your Evernote content, giving you easy access to everything in your Evernote notebooks, including: emails, ideas, images, audio recordings, web pages, docs, PDFs. 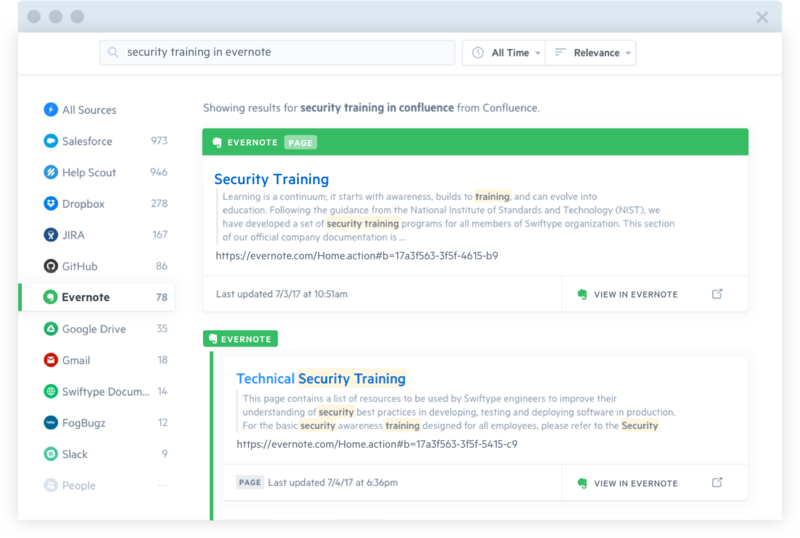 Once indexed, your Evernote knowledge is accessible from any Swiftype Search client, alongside content from other data sources like Google’s G Suite, Confluence, Slack, and more. 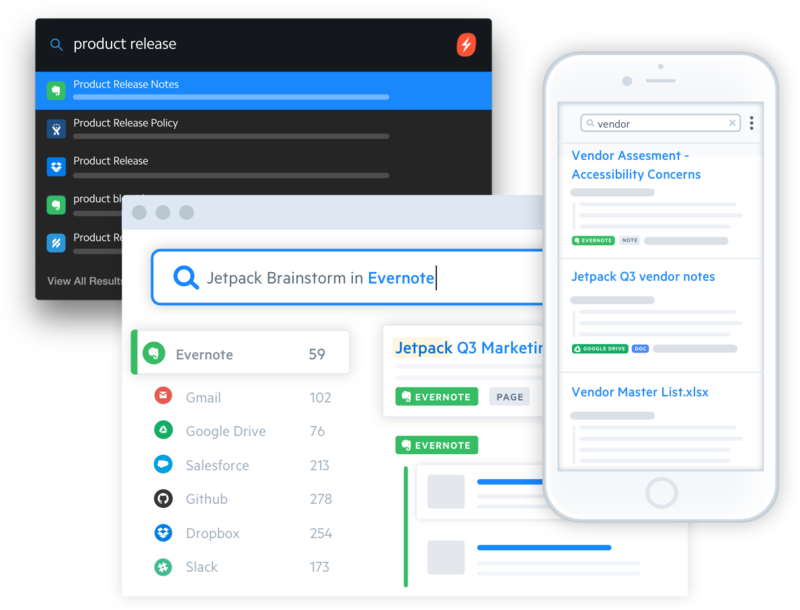 Swiftype is the leading cloud-based Enterprise Search platform. Watch the video to learn more. If you’re anything like us, you use Evernote to collect all your ideas, articles, photos, and notes. We created the Evernote Search browser extension so you can find and view related information across all the apps you use at work without leaving Evernote. Whether you’re planning a project, saving important articles, or simply organizing your to-do list, Swiftype predicts and surfaces related content based on the work you’re doing. 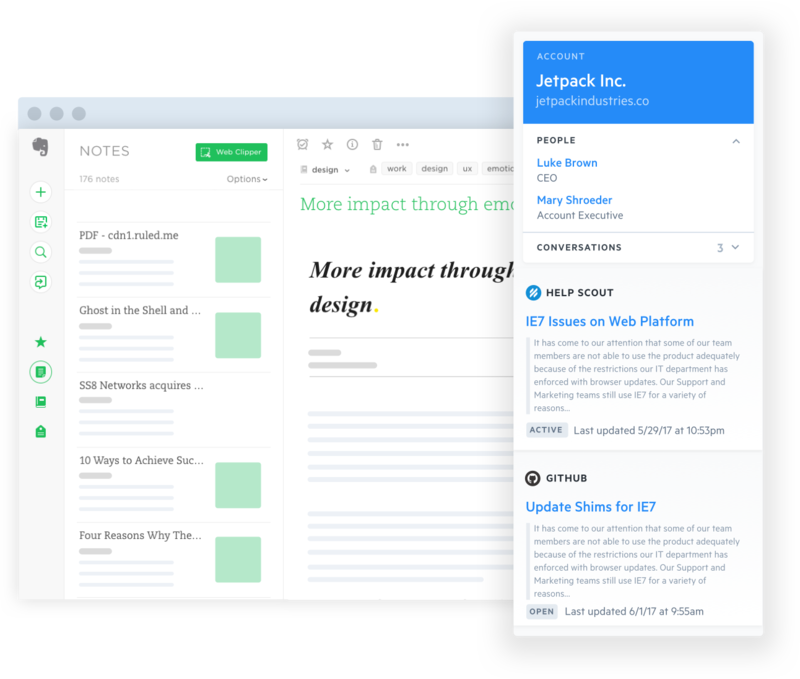 You can easily access your Evernote content from anywhere, whether you’re in Confluence, Salesforce, Slack, or any of the other apps you use daily. Once you’ve connected to Evernote, you can access everything in your notebooks, regardless of the application you’re working in. Your Evernote knowledge is available from any of Swiftype’s search clients (such as a web-based app, mobile app, macOS app, omnibox, and more). No matter which search client you prefer, you can expect to receive only the results that are most relevant to you. Check things off your lists and organize your day more quickly. 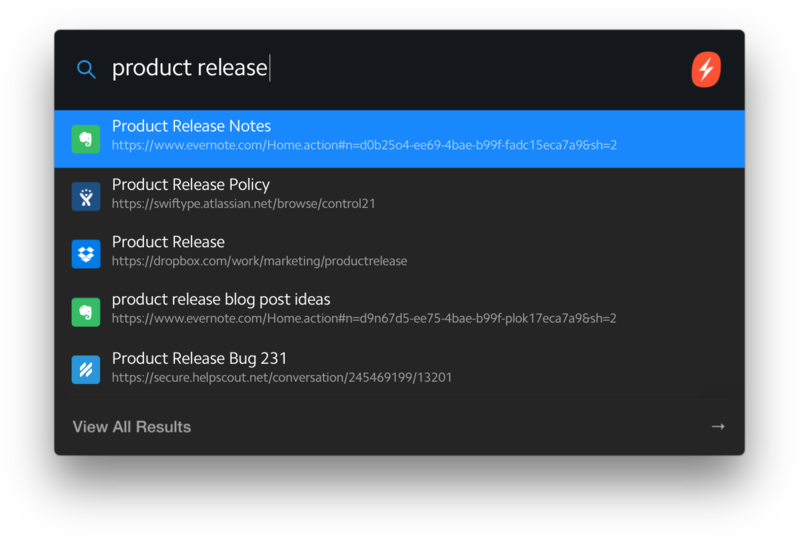 Access and share notebooks, to-do lists, and any of your collections - no matter which app you’re working in. Swiftype predicts and surfaces any relevant content you need, allowing you to get things done with greater efficiency. Not sure if the info you need is in the notebook you’re searching in? Swiftype indexes your entire Evernote instance, giving you the power to significantly improve Evernote’s result relevance. With Swiftype’s full-text search, users are able to leverage our artificial intelligence, machine learning and natural language processing technologies to search as naturally as they speak.